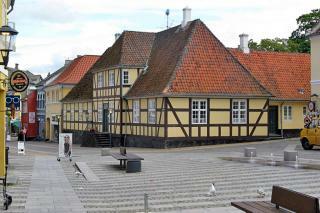 Rudkøbing on the island of Langeland is distinctive for its solid buildings from the 1700s and 1800s. One of the most stately is located by the main square, not far from the town hall and church. Rudkøbing Vicarage presides over the provincial street with its high stone plinth and robust oak half-timbering. The roof is tiled, the windows large and many-barred, and conform to the Baroque period's strict repeating structures of window section, wall section, window section and so forth. A double granite stairway leads to the front door, which is centred in a gabled extension. The residence was erected in 1761 by Pastor Grib as the second replacement for a medieval vicarage which burned down in 1580. The building is still in use as a vicarage.
" Generations of vicars have lived and served at Rudkøbing Vicarage. One of the more remarkable among them was the Reverend Jens Eriksen Grøn. He came from Norway's most northerly parish in Finnmark, and travelled with his family in one stretch all the way to Danish Langeland through the Norwegian wilderness – by sleigh – to take up his new appointment in Rudkøbing. The sleigh has survived and is on show at the Langeland Museum. In 1791 and 1792, the vicar later confirmed two of the brightest minds of the day; the brothers Hans Christian Ørsted and Anders Sandøe Ørsted. The brothers lived at the town apothecary's shop in Brogade, which connects the main square with what was then the town's vital harbour. "